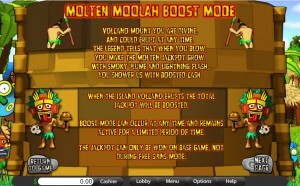 Molten Moolah is a slot machine with a modern layout, but with a tribal theme which takes you to some kind of Pacific island where a volcano is erupting. The island is also inhabited, and you have a chance to see some of the tribe members that live there, along with things like flowers, shells, ceremonial masks, feasts and so on. It’s a Saucify slot machine, and it manages to show off some of the things that make this region special, complete with the Tiki style carvings. Of course, it doesn’t hurt at all that it offers a progressive jackpot. Besides the theme, another thing that makes this game special is the progressive jackpot which can be won if you play on its 5 reels and bet on its 40 lines. There are free spins, a Boost Mode, multipliers, scatters and wilds. Fixed payouts are at $4,000 or less. The slot’s features give you the wild symbol with a multiplier, a scatter, free spins and a boost mode which applies to the jackpot. The Chief symbol shows you a smiling tribal leader, with multi-colored paint on his face. This symbol pays the best in the game (if you discount the progressive jackpot), awarding up to 8,000x when it forms a full combo of five icons. It’s obviously useful as any other wild as well, when it is used as a substitute for other symbols. 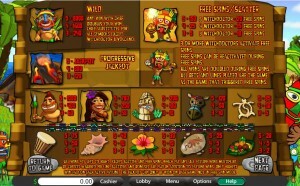 A 2x multiplier will be applied to any wins obtained with its assistance. As it usually happens, it can’t substitute for the scatter, and unfortunately the same restriction applies to the symbol that offers the progressive jackpot as well. Another symbol you should be paying attention to is the Witchdoctor. This being the scatter symbol, you will get paid by it just by having enough of these symbols present on the reels, even if they’re not forming a combo. The payouts are also multiples of the total bet, not the line bet, and you get between 5x and 150x as a reward, depending on how many scatters are in place (3 to 5 needed). The slot has free spins to give you, and you will need at least three Witchdoctor scatters on the reels to get them active. You receive between 10 and 20 free spins if you manage to activate the feature, with the multiplier applied to the wins being 2x. Retriggering free spins is possible. You can get a Boost Mode active as well, but this is a randomly occurring event, without any trigger that you can get on the reels. 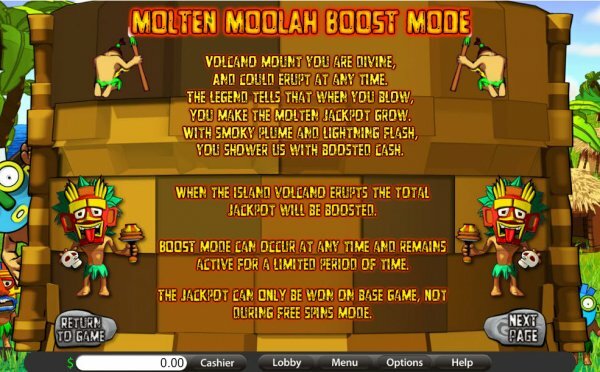 If you do get it active, you will find that the volcano erupts, and that the total jackpot will receive a boost for a limited amount of time. There is also a very nice poem on the paytable, which tells you what the Boost Mode can do for you. The game’s 40 lines require between 40 and 200 coins when the wagers are made, but that’s only if you want all of them active. Each coin also has a denomination that you pick, the minimum being $0.01, the maximum $0.10. You can end up with $0.50 line bets and $20 total wagers. 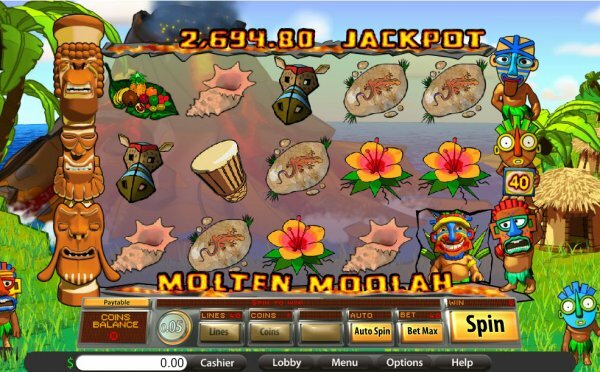 The game’s progressive jackpot is won with help from the Volcano symbol. The alternative is the 8,000x prize that the wild Chief gives you, with a value of up to $4,000. Given the theme of the game, you’re going to get a design which shows off both the tribal village and the erupting volcano which is right next door. The reels are placed between two stacks of Tiki statues. Only themed symbols have found their way onto the reels of the game, with tribal and nature related images. 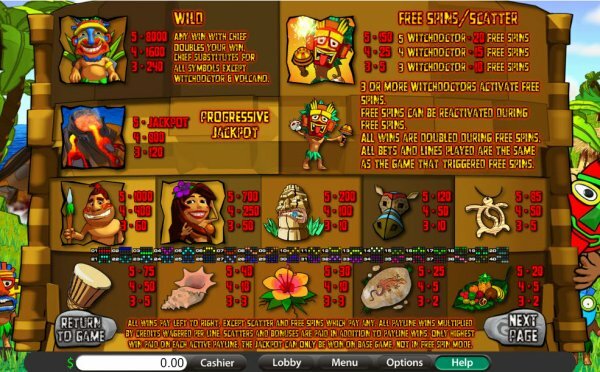 Symbols: Volcano (progressive jackpot), Chief (8,000x, wild), Witchdoctor (scatter, 150x the bet), Warrior (1,000x), Girl (700x), Tiki Idol (200x), Mask (120x), Amulet (85x), Drum (75x), Shell (40x), Flower (30x), Decorated Stone (25x) and Feast (20x). It’s one of the Saucify games that you should absolutely try, and it’s not just the progressive jackpot that makes it a good choice. The other prizes and the features also contribute to the appeal. Molten Moolah can be found at any Saucify casino, where you get a chance to play it for real money or in free mode.